Farlin Bottle Warmer 220 V- For heating/warming liquid in feeding bottles, or canned baby food. ..
NUK is the leading brand of childcare products in Germany With its 680W, it is the most powerfu.. Plastic tongs are for safe and easy removal of clean bottles from the Steam Sterilizer. .. Useful at home and perfect to travel with Slim and Compact design, takes up minimal space Fits 2 w..
Fast 6 minutes sterilization cycle Large storage capacity that can hold up to 5 nursing bottles &am.. Ideal for travel use For parents who regard proper hygiene as paramount concern for their babies N.. Winner of Babycenter's 2017 Best Baby Bottle Prep ToolsYou don't want harsh chemicals anywhere n..
1. Can sterelize up to 6 bottles per session 2. Safe 3. Fast 4. Easy to User 5. Healthy 6. Econ.. Product HighlightsOnly two buttons needed to operate for quick and easy use Cycle..
1. Gradual warming 2. It helps preserve all the properties of milk. 3. Fast 4. Two separate progr.. In a few minutes warm your baby's foot: 1. When it reaches the desired temperature, i..
1. Accommodates most bottles and baby food jars 2. Multiple programming options for customized warm..
1. Effective sterilisation 2. Kills 99,9% of harmful household germs. 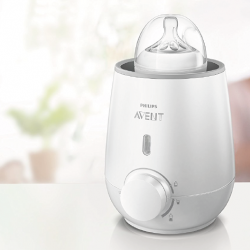 With steam, no chemical addit..
Sterilizes up to 5 Wellbeing baby bottles and 4 Step Up bottles. Innovative design that adapts perfe.. The Microwave Steam Sterilizer holds up to four bottles and keeps the contents sterile for up to thr.. This Tommee Tippee Closer to Nature BPA-free Travel Steam Steriliser is a unique handy travel steril..
Our Microwave Steriliser keeps everything in it sterile for up to 24 hours if you keep the lid close..
Fast and effective sterilisation - up to 4 baby bottles and accessories in just 4 minutes (at 100.. The Dr. Brown's Natural Flow Microwave Steam Steriliser Bags sterilise parts from Dr. Brown's baby b..
1. Tommee Tippee Closer to Nature Bottle and Food Warmer is ideal to provide for feeds when out and ..
1. Closer to Nature Electric Bottle and Food Warmer heats bottles and baby food quickly and safely ..
Descaling sterilizer- Always unplug the appliance and wait until it has cooled down completely befor.. The Dr Browns deluxe bottle sterilizer safely steam sterilizes six bottles in 12 minutes for your.. Plastic Sterilizes up to 4 bottles Holds standard or wide neck bottles Dishwasher safe Us..